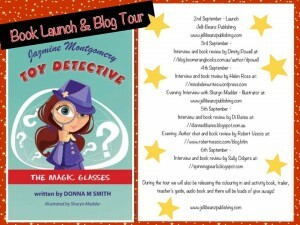 I’m not sure if it is the sleek, bug-eyed appearance of the title character, her sleuth-full occupation or just her name that appeals so forcibly to me, but there’s something about this new Literacy Ladder Reading Series title, Jazmine Montgomery Toy Detective, by Donna M Smith, that I just love. 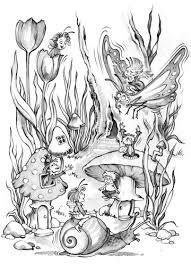 Aimed squarely at 6 – 8 year old emergent and confident readers, this chapter book is brimming with mystery, mushroom elves and magic. Jazmine Montgomery is a girl with a passion for solving dilemmas and is regularly called upon by her school and friends to locate missing toys. Operating from her backyard office (aka the cubby house), Jazmine has a litany of devices she uses to deduce the whereabouts of toys missing in action, but perhaps her most useful is her set of magic glasses, after which the first book in this series is titled. When she is unable to find an errant iPad borrowed from school, Jazmine and her trusty side-kick, Yap (aka the shaggy pet dog) must use the glasses to relocate the iPad in time for school. If she doesn’t, she not only risks detention but her reputation as a detective as well. Who hasn’t gone through this kind of trauma just minutes before the first school bell of a morning? Young readers, especially those of the little-girls-with-large-aspirations variety, are sure to get a kick out of the first in this series. It might even have a few checking under their fruit trees for the tiny villages of mushroom elves, like I did! Each book includes super sleuthing tips and (elf) character descriptions which are perfect for coaxing fledging readers into the magical world of reading alone with confidence. To celebrate Jazmine’s awesome success as a Toy Detective, today I welcome her creator to the draft table, author and publisher, Donna Smith. So grab a big bag of jelly beans, settle back and get comfy. Q: You have published a varied selection of work for children Donna, including short stories, picture books and Haiku poetry. Name a stand out piece that you are most proud of and why? Yes Dimity, some of my work is varied. 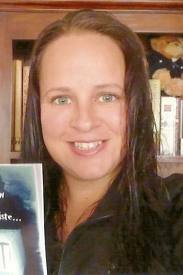 Thank you for asking about the various genres I have written. I have also been fortunate enough to have had several text books published and course content for the Adult Education sector. Choosing one piece is difficult as I love them dearly for various reasons. Mr Bumblebottom which appears in the ‘Hopscotch’ anthology holds special significance, not only was it one of the first stories I wrote but it evolved over the course of two years whilst my eldest son Timothy, was at three and four year old kindy. This took place about seven years ago. Timothy really did not want to go to kindy and so I told him there was a magical dragon that would sit in his pocket throughout the day and he would take special care of him while he was a kindy. Over time, Timothy named him and told me what colour he was and lots of stories about how he felt happy at kindy when Mr Bumblebottom was there too. So over the two years while Timothy attended kindy, Mr B as he was known became an important part of the family. When Timothy started school, I whispered to him as he went into class for the first time that Mr B was in his pocket and he replied, ‘Mum, I am a big boy now shhh.’ I will say he did appear from time to time in need. So this story is quite special and at present I am working on it to be launched as a picture book. A Shadow of Cape Naturaliste, also holds special significance as it was the first story accepted by a publisher. At that time, I replied to an ad for stories at least 2500 words which must be historical fiction and a ghost story. I relished in the research process and found the Cape Naturaliste lighthouse on the Western Australian coast line has quite a haunted past. So, I wrote Harry’s Lighthouse (as the title was back then). It was published in Australian Chillers’ anthology in 2009. 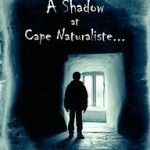 A few years later I decided to re-tweak it for a slightly younger audience and it became A Shadow at Cape Naturaliste. I love this book, the cover is perfect. The photograph depicts what I had imaged it to be exactly and the size is a perfect companion. This book has done well in grade three- six classrooms and is also available it the lighthouse gift shop. 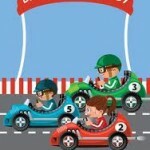 Billy Cart Derby is a really exciting, fast paced, giggle of book starring Jaz, TJ and Ben who participate in a billy cart race at school as a fundraiser. Jaz, TJ and Ben are based on my three children Jazmine, Timothy and Benjamin. What is interesting Dimity is that I wrote this book when Jazmine was in grade 1 (now grade 6) before Ben was even born. I wrote a draft based on a dress up day I attended at school where I saw a grade 6 girl wearing a billy cart. I thought it was fantastically inventive. So the story started to take shape about a billy cart race at school which was based on fundraising but during the race they had lots of mishaps. After the initial draft a couple of years later, I was pregnant with Benjamin and I decided to wait until he was born (to see if he was going to be a boy or a girl) before I completed the final draft so I could include all three children. I ended up waiting until Benny was in kindy and developed his own little personality and character so as I could make teh characters true to their real personalities. I just love the story so much. Children just find it hysterical. Billy Cart Derby is currently used in classrooms grade prep through to about four. Actually a grade three class used it last year during their narrative study. Billy Cart Derby has coloured glossy billy cart race track maps in the front of the book along with character illustrations. This book is currently undergoing production to be made into an interactive picture book, which is illustrated of course. I plan to write more about Jaz, TJ and Ben’s school adventures in the future. Delightfully Haiku is also very special as it was my first poetry collection but, more importantly it was also a dedication to my nephew Marshall who was born sleeping in August 2010. It has received wonderfully positive reviews over the past couple of years which lead to being invited to participate in the Japanese Festival since it began in 2010. I have attended each year since and enjoy holding haiku poetry workshops throughout the day. A Christmas Tail was born several years ago when my daughter’s Victorian doll house (which stands 1.2 metres tall) became home to a beautiful family of wooden dolls which my daughter still loves to play with. Over time we furnished the doll house, put lighting in, pictures on the wall, even a tiny grand piano sits in the living room. The idea of a story evolved. A Christmas Tail was co –written with Helen Ross, a very talented children’s writer and former primary school teacher. This beautiful picture book was illustrated by Aaron Pocock, a well known Brisbane artist who did a fantastic job bringing the story to life. A Christmas Tail kicks off a book launch tour in November so keep your eyes peeled for more information regarding that. Jazmine Montgomery – Toy Detective series is based on my daughter Jazmine. Jaz tends to see magic in everything even at almost 12 (in a few weeks). I love the idea that not everything can be seen and just because we can’t see it on the surface doesn’t mean that it’s not real or it’s not there. Jazmine Montgomery has many case files that she will be sharing in the future. The Magic Glasses is book one in this new series. It is really hard to pick just one book. My books hold special meaning and significance for myself and my family. Q: What was the inspiration behind the character Jazmine Montgomery? JM is based on my daughter Jazmine, who possesses a beautiful innocence and ability to see magic in everything. Jaz will be 12 in a few weeks and is still very much a little princess. Q:What was the best thing about writing Jazmine Montgomery and the most difficult? I think the most difficult aspect of writing the first of this series was the evolution that took place. I wrote the first draft a couple of years ago and after editing with Sally Odgers, it was discussed the possibility that an aspect of the story could outdate quickly. The original story was about a red scooter that was lost. Once it was decided that this may not work as well as something which was just flooding the market and being implemented in schools (such as the iPad), I had to re-write many sections to fall in line with iPad concept. Therefore this story evolved and underwent many visits for ms assessment by Sally before the final story was complete and Sally began the editing process. We worked on this story for quite some time before it was just perfect. I then contact Sharon Madder and was just delighted with her illustrations. Sharyn was wonderful to work with and I am really happy with the final result. Another difficult aspect of this particular book was the layout. I really wanted to incorporate the stars which appear around the pages, I had to create each individual star and place each one exactly where I wanted it to appear, this was very time consuming. Then my design team headed by Sylvie Blair, converted this in InDesign to make each star digital and keep the placement the same. This process was quite tricky, time consuming and expensive however, I am really happy that we kept at it as it turning out really well. It really sets the book off, particularly for the target age group. So this book has taken quite some time to produce and get just perfect. But well worth it. I must credit Sally Odgers as it was her idea of the stars on the page! Thank you again Sally. Q:You have aimed this chapter book series for younger primary aged children, what motivates you to write for this age group? My children I think Dimity. My children Jazmine 11 (she reminds daily that there are not many sleeps until she is 12! ), Timothy 10 and Benjamin 7, inspire me every day. Our library at home is a favourite room in the house, it contains many, many picture books, early chapter books and novelettes. We read these sorts of books most often. I have had a few funny looks after purchasing an arm full of children’s books and then nestling down to read them in a cafe. I have surrounded myself with these sorts of books primarily because of the ages of my children, therefore it just happened that way. I am excited however about my next book, Benjamin and the Castle of Tomorrow which I have been writing since 2009. It started as a 2500 chapter book, and just became longer and longer. Sally said to me ‘don’t worry just keep writing.’ The book now some 25000 words has visited Sally’s desk more times than I can remember and has been a journey in its self. Two trips to England to study castles and medieval culture, I took medieval literature electives during my Arts degree and submitted a draft as part of my final portfolio assessment in my children’s literature unit. I have also studied endless waterfall locations and waterfall photography, dragon myths and written under Sally’s guidance for the past four years. The story is metafictional and something I am very excited about. I am very happy to say- the story is complete and the editing process is now underway. So, I guess Dimity this will be a different genre again! Ben’s story, as Sally and I refer to it as, after all these years will be out next year. Q: Have you or your children ever come across elves or fairies in your garden? Of course Dimity, magic is everywhere. Just smile on the inside and out! Q:What can we expect from Jazmine Montgomery in the future? Jazmine Montgomery has an exciting collection of case files which has solved and worked on with her companion Yapps and the Mushroom Elves. Their next adventure sees them at school trying to solve the mysterious case the missing counting beads in the preps class. Q: What is on the storyboard for Donna Smith? I graduated with my Arts degree in April this year. My main stream was Educational Psychology and Writing/ Literature. 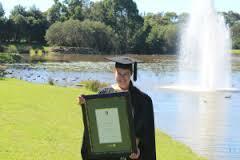 My youngest son has been struggling at school with a learning disability so I decided to attend Monash Uni earlier this year and complete their one semester course in Education Support/ Teacher Aide course with the aim to help Ben as much as I can. I have just completed PD training in Cued Articulation and really enjoy helping in his class two mornings a week. It has six years now that I have being doing classroom help with my children since they started school, however now I am helping in literacy intervention which I really enjoy. I was deciding whether to continue study in literature, however due to our circumstances with my son and recent further diagnosis, I have decided to continue study next year in the Masters of Special Education with a major in Literacy Support. As I also manage Jelli-Beanz Publishing, I am busy with a catalogue of titles which have approved contracts by various authors. Earlier this year I was fortunate enough to become a team leader at the Victorian College of Literary Arts which will see me working literacy invention programs, which is exciting. And my writing? Helen and I are currently brainstorming Peter’s next adventure, Jazmine Montgomery’s next case file will emerge and Benjamin and the Castle of Tomorrow will be released next year. 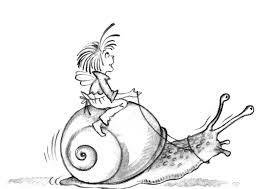 Mr Bumblebottom will take flight as a picture book and Billy Cart Derby will be skidding into the interactive app world! Gee wizz, a cup of tea somewhere in there would be nice too! 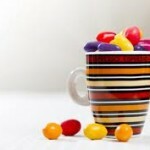 Q: Just for fun, do you have a favourite Jelly bean? What is it? Oh yes, I love Jelly beanz, my favourite is black! Wouldn’t it be wonderful if there was a rainbow jelly bean? (Oh yes! But black is my favourite too!) Thanks Donna and good luck with EVERYTHING including nabbing that cup of tea some time soon. Check out the Book Trailer for The Magic Glasses. Buy the book here. Be sure to visit Jazmine as she zips around on the rest of her Blog Tour with Donna Smith. It’s a pleasure Sally. Always in admiration of those who can pull of so many great acts at once. Thank you for visiting today. I hope the weather is as beautiful in Tasmania today as it is here. And Sally has such wide, encompassing and able wings from which we can all flourish. Thanks ladies. Great questions Dimity. I really enjoyed the interview. Look forward to your next stop, Donna. Talk soon. Thanks for popping by today. I am glad you enjoyed the interview. I am looking forward to all of the visits during my blog tour and lots of jellibeanz along the way. I had a great time visiting you yesterday. As part of my blog tour I am giving away a FREE ebook each day to those readers that pop by and say Hi. 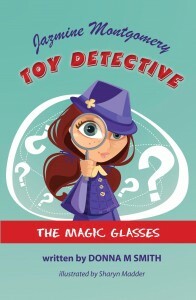 Congratulations to Cherri Ryan, you have won a copy of Jazmine Montgomery Toy Detective ebook. We will forward you your unique code to redeem on iTunes, via private message. It is my pleasure Dimity. I hope Miss 7 enjoys the magic within!